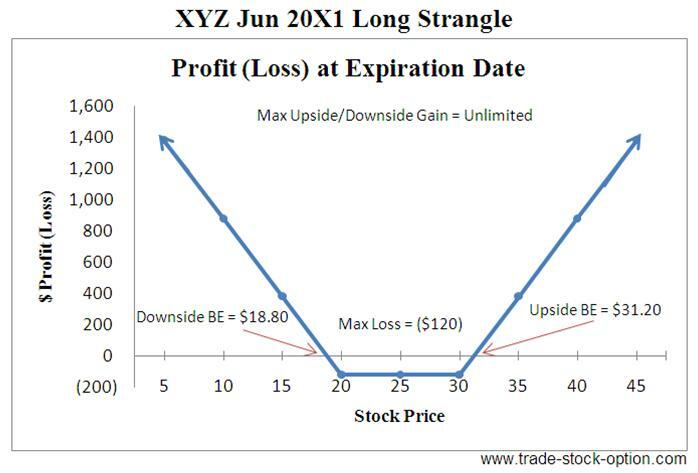 Long Strangle is one of the delta neutral strategies employed in a highly volatile stock. It usually involves buying Out of The Money puts and calls options with the same expiration date and underlying stock but at different strike prices. Limited to the Net Premium Paid for the Out of The Money puts and calls options. Potentially unlimited to the upward or downward movement of the underlying stock. This is a net debit trade as you are buying the puts and calls options with different strike price but same expiration date. Potentially unlimited profit potential beyond the breakeven point in either direction. Limited risk exposure to the net premium paid when the underlying stock is between the 2 strike prices on expiration date (where both puts and calls options expired worthless). This strategy costs less than a Long Straddle because Out of The Money options is less expensive than At The Money options. This lower cost basis provides a potentially higher percentage return. Time decay hurts long options as options are a wasting asset. This goes double for a Long Strangle if the strike price, expiration date or underlying stock are badly chosen. Significant movement of the stock and options prices is required for this strategy to be profitable. This stock option strategy also require the underlying stock to make a larger move compare to a Long Straddle in order to make profit. If the underlying stock surge up, sell the call options (making a profit for the whole position), and wait for a pull back to profit from the put options. If the underlying stock plunge down, sell the put options (making a profit for the whole position), and wait for a retracement to profit from the call options. Offset the position by selling both the puts and calls options that you have bought in the first place. Assumption: XYZ is trading at $25.85 a share on Mar 20X1. The full year earning announcement for the company is about to be made. 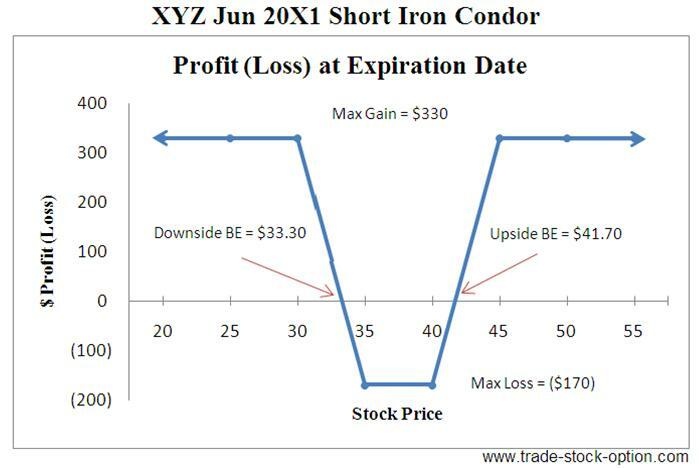 You are expecting share price of XYZ to soar up or plummet down once the announcement is out. However the cost of At The Money puts and calls options are too high for you. 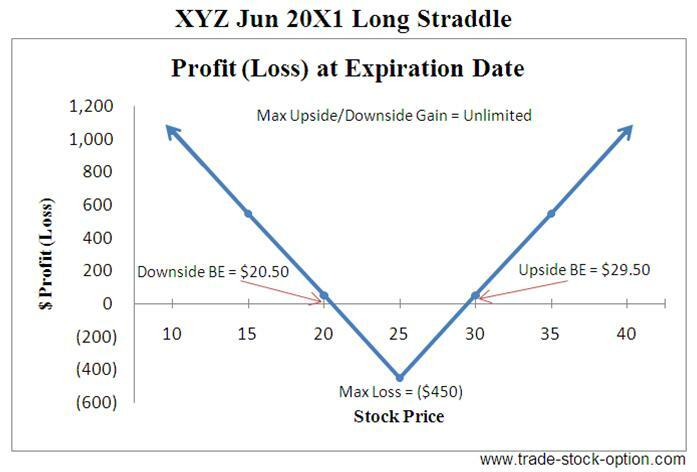 In this case, you may consider to buy one Jun 20X1 $30 strike call at $0.70 and buy one Jun 20X1 $20 strike put at $0.50 to profit from the volatile outlook of the stock. Note: commissions are NOT taken into account in the calculation. = Potentially unlimited beyond the upside and downside breakeven point of the underlying stock. This is a slight adjustment to the Long Straddle strategy to make it less expensive. You just need to buy an equal number of puts and calls options of the same expiration date but with different strike prices so that you can make a profit whether the stock move up or down. The good point is you don’t care which direction it move, as long as it moves sharply in either directions. For this strategy to be profitable, a rise in the call options value must be able to exceed the fall in the put options value. Or a rise in the put options value must be able to exceed the decline in the call options value. 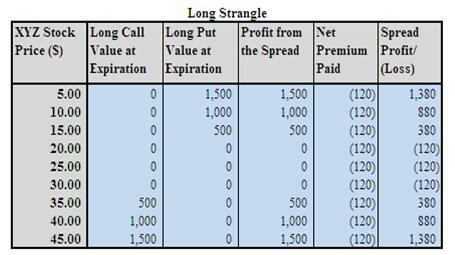 A Long Strangle can be executed at any combinations of strike prices but is typically established at the mid point of strike price near At The Money option. Try to ensure that the implied volatility of the selected stock is currently very low, giving you low option prices, but the stock is about to make an explosively move, just that you are not sure in which direction. This is a net debit trade as you are paying the premium for both the puts and calls options. This option strategy is typically a bet on the volatility expansion. Verdict of law suit, product announcement, earning or economic reports do have a tendency to move the stock price sharply up or down. Some traders prefer to purchase the strangle at a time of low volatility before the announcement and sell at a time of high volatility after the announcement. 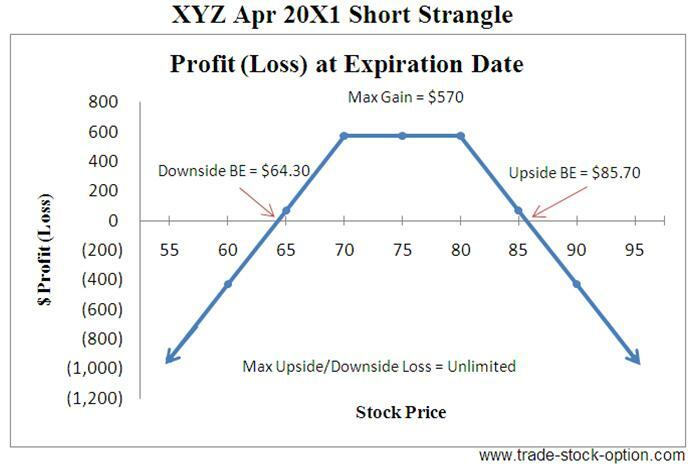 Whether to use a Long Straddle or Long Strangle is typically a judgment call between lower cost and probability of stock making the explosive move up or down. You should pick the strike price and time frame of the strategy according to your risk/reward tolerance and forecast outlook of the underlying stock. Having the patient to wait, knowledge to apply and discipline to follow through the option trading strategies with appropriate risk-reward parameters is important to your long term success in option trading. Typically used to lower cost of Long Strangle at the expense of cap profit. Next go to another volatility strategy, Short Call Butterfly, to learn how profit can be make from a volatile stock.